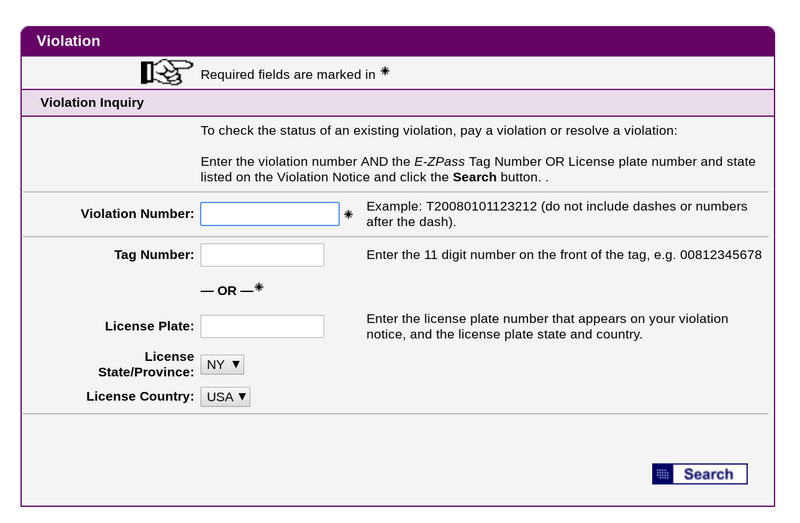 The EZ Pass NY Pay Violation service is operated by EZ Pass New York and is associated with getting a ticket related to a toll. The electronic toll collection system allows drivers to move easily between tolling stations saving time and money (this takes the cash, coins and toll tickets out of the toll collection process making life easier for everyone). The EZ Pass is used by states in the Northeast United states (i.e. New York, New Jersey). Common reasons why a driver may receive a ticket via the EZ Pas NY Pay Violation service include speeding (go through a toll both way to fast), class mismatch (the tag the auto is register to is being used on a different auto), the driver went though the toll but did not have enough money in their account, and toll evasion (driving through a toll without a E-ZPass tag mounted in the vehicle). Those who would rather mail their payment in can send it to: E-ZPass Violation Payments and Inquiries PO Box 15186 Albany, NY 12212-5186 or fax it to 1-718-816-0762. Payments can also be made over the phone using any major credit or debit card (i.e. Visa, American Express) by calling the EZ Pass NY pay violations automated toll number… 1-800-333-TOLL(8655).